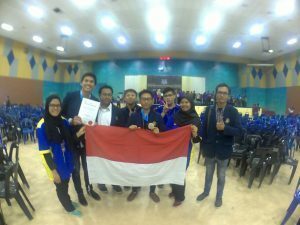 Four students of the Faculty of Economics and Business Universitas Brawijaya succeeded in achieving achievement in the international arena. Yamamo Satrio, Raditya Hidayat, Joshua Lagutan Manullang and Ibham Yumna from the Management Department of 2015 succeeded in bringing home the Bronze Medal and Special Honor of Invention from Canada in the international competition Engineering Invention Innovation Exhibition 2018. Competition followed by more than 300 teams from 19 countries was organized by ENVEX Young Researcher Club (EYReC) was held on 13 April to 15 April 2018 at Universiti Malaysia Perlis, Perlis, Malaysia. The 10-member team, making an innovation an anti-violence hijab that is useful for protecting Muslim women from violence. in his presentation, Yamamo Satrio and Joshua Lagutan Manullang explained that the market achieved with the creation of this technology is enormous. Violence against Muslim women lately became the main topic, especially when the world community began to blame acts of terrorism as a result of the presence of Muslims in the world. That’s why this technology is developed. “Further market research will be conducted so that this product can be commercialized and product development,” said Yamamo Satrio. Belajar di Fakultas Ekonomi dan Bisnis, Universitas Brawijaya.